Capture the magic of your upcoming wedding with photo wedding invitations from Invitations by Dawn. Our photo invitations allow you to include the perfect picture for creating an invitation guests will love. 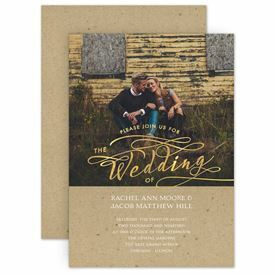 From fun-loving pictures to professional shoots, Invitations by Dawn can help you create the perfect photo wedding invitations to symbolize your love. After browsing our photo invitations, don't forget to check out wedding decorations to coordinate with your wedding style. If you love the idea of featuring photos as much as possible throughout your wedding stationery, check out the many stylish photo thank you cards we offer. Thank you cards are an excellent way to use your wedding photos. You’ll find single-photo designs as well as a few multi-photo designs, and some are even available as postcards for a sweet, simple and affordable thank you note option.